As too Catholic minded an Anglican, Campion was suspected, and exposed to danger. Hidden in friendly houses, he composed his treatise called "A History of Ireland" Written from an English standpoint it gave much offence to the native Irish, and was severely criticized, in the next century, by Geoffrey Keating In his Irish history of Ireland. Urged to further effort by the zeal of Gregory Martin, he crossed to England in disguise and under an assumed name, reaching London in time to witness the trial of one of the earliest Oxonian martyrs, Dr. John Storey. 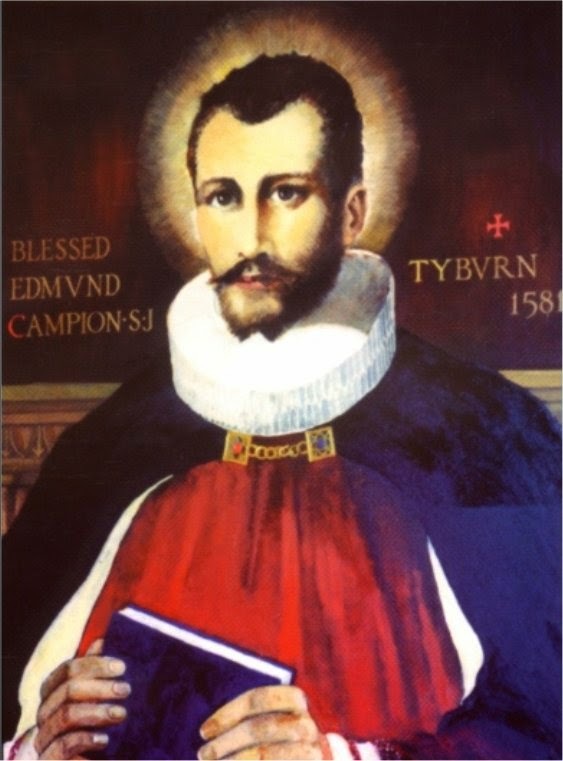 Campion now recognized his vocation and hastened to the seminary at Douai. Cecil lamented to Richard Stanihurst the expatriation of "one of the diamonds of England" At Douai Campion remained for his theological course and its lesser degree, but then set out as a barefoot pilgrim to Rome, arriving there just before the death of St. Francis Borgia; " for I meant", as he said at his examination, "to enter into the Society of Jesus, thereof to vow and to be professed". This he accomplished promptly in April (1573), being the first novice received by Mercurianus, the fourth general. As the English province was as yet non-existent, he was allotted to that of Bohemia, entering on his noviceship at Prague and passing his probation year at Brunn in Moravia. Returning to Prague, he taught in the college and wrote a couple of sacred dramas; and there he was ordained in 1578. Meanwhile, Dr. Allen was organizing the apostolic work of the English Mission, and rejoiced to secure Fathers Robert Parsons and Edmund Campion as his first Jesuit helpers. In the garden at Brunn, Campion had had a vision, in which Our Lady foretold to him his martyrdom. Comrades at Prague were moved to make a scroll for P. Edmundus Campianus Martyr, and to paint a prophetic garland of roses within his cell. Parsons and Campion set out from Rome, had many adventures, and called upon St. Charles Borromeo in Milan, and upon Beza in Geneva. Campion was met in London, and fitly clothed, armed, and mounted by a devoted young convert friend. His office was chiefly to reclaim Catholics who were wavering or temporizing under the pressure of governmental tyranny; but his zeal to win Protestants, his preaching, his whole saintly and soldierly personality, made a general and profound impression. An alarm was raised and he fled to the North, where he fell again to writing and produced his famous tract, the "Decem Rationes". He returned to London, only to withdraw again, this time towards Norfolk. A spy, a former steward of the Roper family, one George Eliot, was hot upon his track, and ran him and others down at Lyford Grange near Wantage in Berkshire on 17 July, 1581. Amid scenes of violent excitement, Campion was derisively paraded through the streets of his native city, bound hand and foot, riding backwards, with a paper stuck in his hat to denote the " seditious Jesuit". First thrown into Little Ease at the Tower, he was carried privately to the house of his old patron, the Earl of Leicester; there he encountered the queen herself, and received earnest proffers of liberty and preferments would he but forsake his papistry. Hopton having tried in vain the same blandishments, on Campion's return to the Tower, the priest was then examined under torture, and was reported to have betrayed those who had harboured him. Several arrests were made on the strength of the lie. He had asked for a public disputation. But when it came off in the Norman chapel of the Tower, before the Dean of St. Paul's and other divines, Campion had been denied opportunity to prepare his debate, and had been severely racked. Thus weakened, he stood through the four long conferences, without chair, table, or notes, and stood undefeated. Philip Howard, Earl of Arundel, who was looking on in the flush of worldly pride, became thereby inspired to return to God's service. The privy council, at its wits' end over so purely spiritual a "traitor", hatched a plot to impeach Campion's loyalty, and called in the hirelings Eliot and Munday as accusers. A ridiculous trial ensued in Westminster Hall, 20 Nov., 1581. Campion, pleading not guilty, was quite unable to hold up his often-wrenched right arm, seeing which, a fellow prisoner, first kissing it, raised it for him. He made a magnificent defence. But the sentence was death, by hanging, drawing, and quartering: a sentence received by the martyrs with a joyful shout of Haec dies and Te Deum. Campion, with Sherwin and Briant, who were on a separate hurdle, was dragged to Tyburn on 1 December. Passing Newgate arch, he lifted himself as best he could to salute the statue of Our Lady still in situ. On the scaffold, when interrupted and taunted to express his mind concerning the Bull of Plus V excommunicating Elizabeth, he answered only by a prayer for her, "your Queen and my Queen". He was a Catholic Englishman with political opinions which were not Allen's, though he died, as much as ever Felton did, for the primacy of the Holy See. The people loudly lamented his fate; and another great harvest of conversions began. A wild, generous-hearted youth, Henry Walpole, standing by, got his white doublet stained with Campion's blood; the incident made him, too, in time, a Jesuit and a martyr.